Located on the banks of the Mekong River, the resilient city of Phnom Penh is in the process of reclaiming its former glory as the ”Pearl of Asia”. 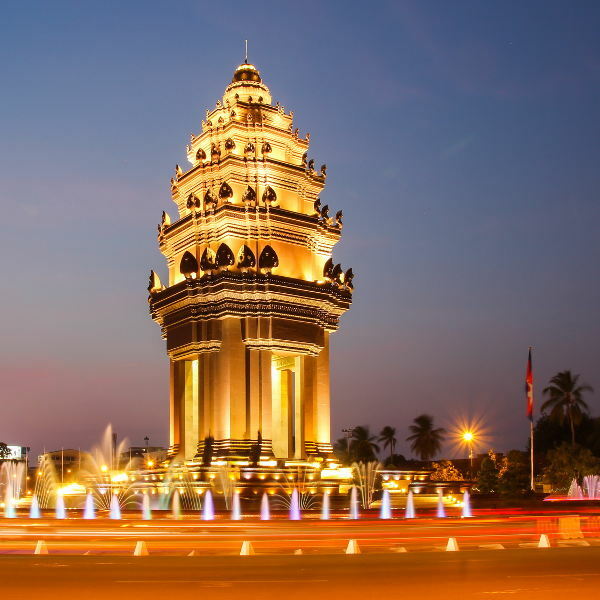 Phnom Penh is a lively city, bustling with expats, tourists and locals alike. The city depicts a deep sense of spirituality and culture, evident in its sacred temples and palaces. Cheap flights to Phnom Penh are now available for a limited time only, so book your flight today and experience the historic evolution and regal splendour this vibrant city has to offer! 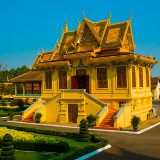 Phnom Penh is home to Phnom Penh International Airport (PNH), a 20-minute drive from the city centre. Home to a mixture of Thai, Indian and Khmer influences, the city is home to many sacred temples, where a deep sense of Buddhism is still practised by local monks and civilians. Peruse the central and Russian markets and tap into the local street food as you bargain for some handmade trinkets and rich fabrics. Experience informal singing and music parades by local groups along the riverfront. Bear witness to the horrors of the Khmer Rouge through the eyes of key survivors. Tours to the Genocide Museum and Tuol Sleng Prison are not to be missed by history lovers. Peak tourist season runs from November to February when temperatures are a lot cooler and more comfortable to explore the temples and surrounds. Temperatures peak to 35°C between March and May, when many tourists opt to explore the coast, making this an ideal time to take advantage of dispersed crowds and lower rates. The rainy season, occurring between June and October, can present some challenges for outdoor tours and activities where roads can become flooded which hampers getting around. Should you find yourself in Cambodia during mid-April, you’ll experience the hype and festivities of the Khmer New Year where you’ll be greeted by excited, painted faces and splashes of colour and music adorning the streets. Situated on the banks of the Mekong River, Phnom Penh was known as the “Pearl of Asia” in the 1920s. Since the 1990s, Phnom Penh has experienced booming economic growth among expats and tourists, paralleled with its rapid population growth, and it is finally overcoming a legacy of war and revolution. The city boasts some of the finest architecture and spiritual landmarks evident in its temples and pagodas. The striking Royal Palace with its classic Khmer roofs and ornate gildings, dominates the Phnom Penh skyline. Within the Royal Palace compound is the extravagant Silver Pagoda, the floor of which is covered with five tons of silver. 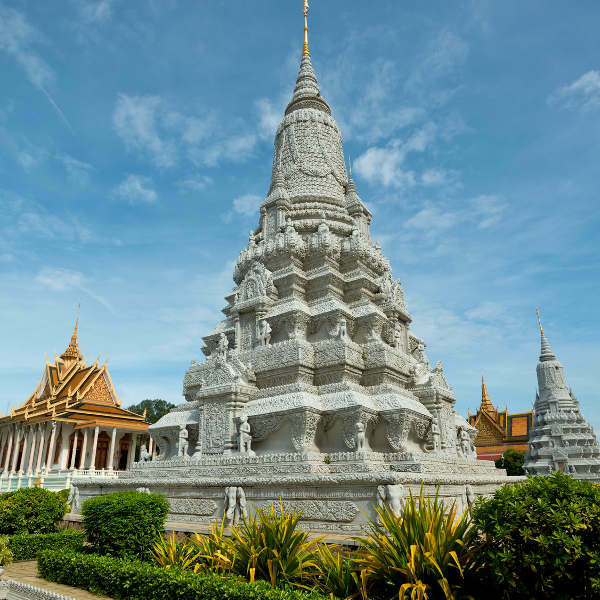 Visitors can take a full-day private tour which includes the Royal Palace, the Silver Pagoda, the National Museum and other fine sites around Phnom Penh. For animal-lovers, the Phnom Tamao Wildlife Sanctuary is home to a large tiger population, and you can find elephants taking part in painting activities. Other animals include macaques, gibbons, deer, Malayan sun bears, crocodiles and a huge variety of birds from around Cambodia. Those who want to know more about Cambodia’s turbulent past can go on a guided tour of the Genocide Museum and the Killing Fields with its 129 mass graves. 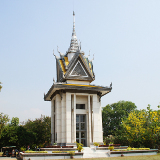 A monument has been erected here that serves as a memorial to the approximately 17 000 men, women and children who were executed by the Khmer Rouge between 1975 and 1978. No matter how long your stay, you'll be fascinated by the stories and people of this historical city. Compare several airlines and book your cheap flights to Phnom Penh online at Travelstart! 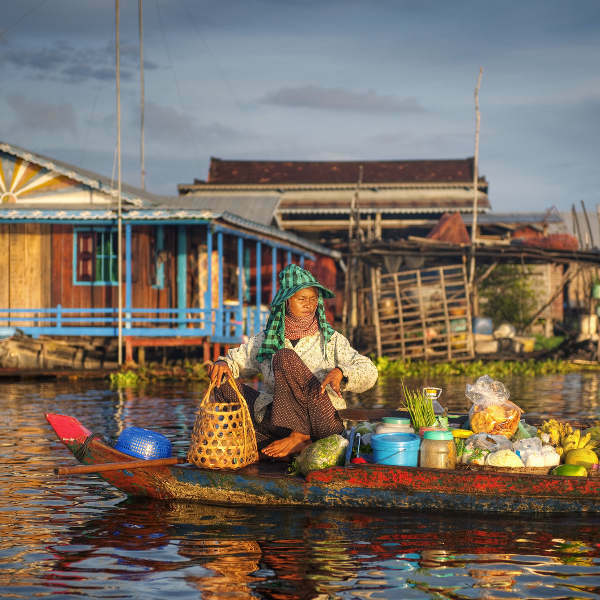 There are no required vaccinations for travellers to Cambodia, however immunisations against Hepatitis A and Typhoid and recommended due to possible contact with contaminated food and water. Malaria is prevalent in non-urban areas, so if you venture out of the city you should consider taking anti-malaria medication. Note that Dengue Fever is widespread so take necessary precautions. Travellers wearing contact lenses may be affected by the extreme levels of dust in the city, so bring along big sunglasses to protect your eyes. The sun is extremely hot so wear lots of sunscreen and stay well-hydrated with BOTTLED water! Due to healthcare not being of the best standard, it is highly advised to take out comprehensive medical travel insurance before departing. Although Phnom Penh is generally a safe city, be aware that tourists are common targets for scams and petty theft, so keep valuables close and don’t engage in conversation with strangers approaching you as this is often a decoy for pick-pocketing. When riding in a tuk-tuk, keep bags and cameras towards the middle to prevent bag-snatching. Be aware of leaving valuables locked in the safe of your hotel or guesthouse. Hotel staff are often culprits of theft, so best to bring your own lock rather than using the hotel's. As in most Asian cities, accommodation in Phnom Penh is varied and good value for money. Lodging ranges from budget guesthouses, dorms and mid-range hotels to luxurious palaces and resorts. For travellers on a budget looking to socialise with fellow backpackers, there is a range of hostels near the former Lakeside, while Streets 51, 111 and 172 also have some great wallet-friendly options. Most places include breakfast and Wi-Fi, but you may need to pay extra for a hot shower. There is a range of hotels and serviced apartments near the Royal Palace, while Sisoweth Quay boasts an abundance of mid-range to luxury hotels right on the Riverfront. Unless you plan on spending a lot of time in your hotel, basic amenities are sufficient as you’ll be spending the majority of your days touring the sites and walking around the city. There are cafés and restaurants galore along the riverfront, while the food stalls and bars along the inner streets and alleyways cater to locals and more exploratory travellers. Local eats from street vendors cost between $1-5, while dining at a mid-range restaurant will set you back around $10. Bills can be paid in US Dollars or Cambodian Riel. Keep in mind that the smallest tear or flaw in a US Dollar bill, renders it unusable in Cambodia. The best way to truly experience the raw lifestyle and modest culture of the local people is by walking around. Although inhabited by regal palaces and majestic temples, Phnom Penh is by no means a glorified city, and the only way to appreciate its simplicity and edge is to walk the streets. Nevertheless, be aware of wayward traffic when crossing the roads as drivers are not always attentive to pedestrians. Avoid walking alone at night – stick to a group or take a taxi. A slow, scenic way to tour the city is by cyclo. Cycling is also a good option and bicycles can be rented for $2 a day. If you prefer some independence, you can easily rent a motorbike or scooter for around $6 a day; however, if you are not familiar with the chaotic roads, this can be a stressful and unpleasant experience. Always wear a helmet and drive carefully (expect the unexpected!). Metered and non-metered taxis are available throughout the city, particularly down at the riverfront. Agree on a fare beforehand, or make arrangements through your hotel. If you don’t mind a bumpy (and more exciting) ride, flag down a tuk-tuk and be explicit about your destination with the driver. Not all drivers speak English, so it’s best to have your hotel/ destination written down for them to see. Some drivers may appear lost so a map is handy to have. Trips around the city shouldn’t cost more than $3, but negotiate a fee beforehand. If you’re planning a day trip to the museums, a great option is to hire a driver for the day or half-day (arrange this with your hotel) and usually costs between $15-20.